Almost every desktop application deals with some kind of external memory to save data for further use. The most part of them, use a database. On the other hand an Application needs connection string to connect to the database, for handling its memory. So, how to use connection string and how to manipulate with it, that’s the question which this post wants to answer. If we want to change the connection string during the application run-time, it is not a simple task, because the connection string is placed in to an application scope that is read only. The reason why we need to change the connection string is the different settings and environment between users, as well as different environment between developer and end-user. So when we are planning application deployment we must have that in mind, and provide the implementation custom modification of the connection string. 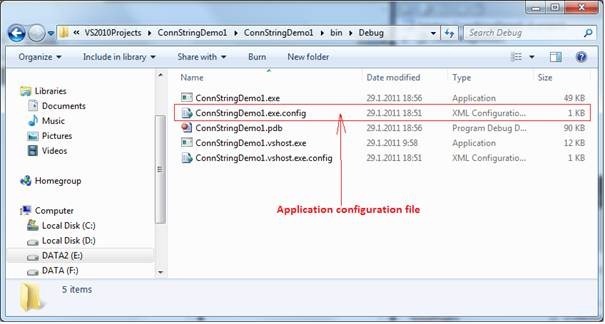 If we look files of an Application (for example on the picture above) we can see two exe file, and two corresponding configuration files. 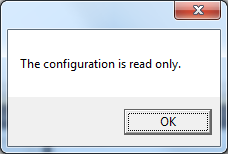 This is the .NET rule, that every exe file may have only one configuration file. The picture above shows content of the configuration file and the connection string data. .NET Application can access this data with the API placed in to System.Configuration namespace, by using specific XML schema developed by Microsoft for that purpose. So the question is how to change connection string anyway? As you already know the connection string for Entity Framework is little bit different than the connection string used by DataSet and Lin2SQL. In order to modify the Entity framework connection string the previous code must be modified. 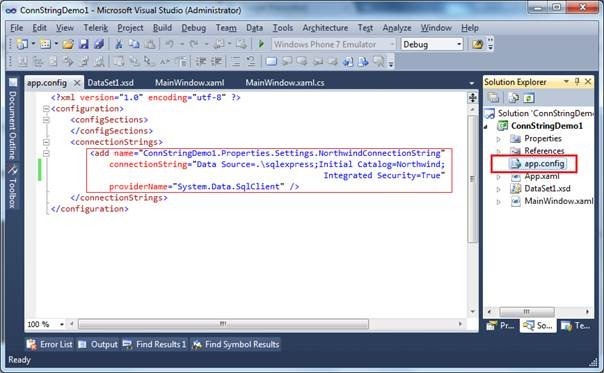 The following code modified the entity framework connection string. In the previous code we used the EntityConnectionStringBuilder which is very handy in this situation. The source code for this post you can find on SkyDrive. 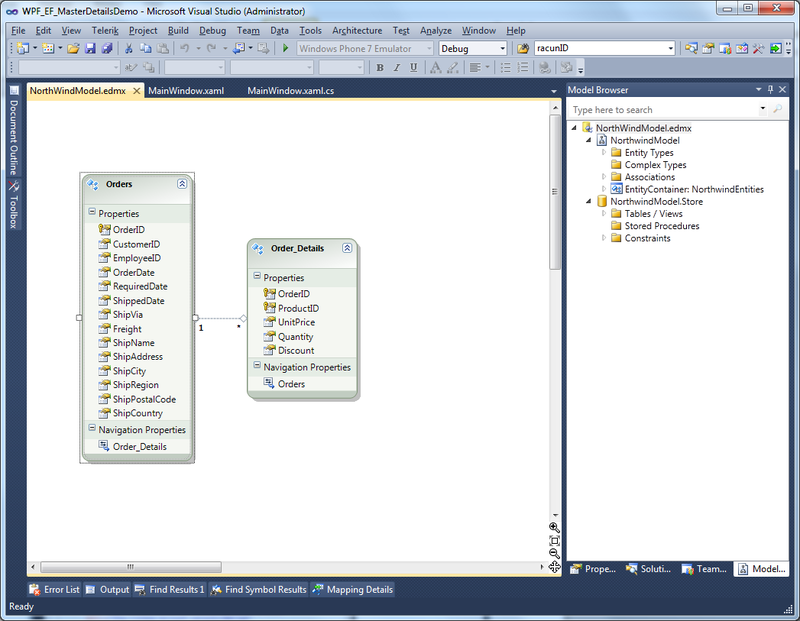 Now that we have starting project, we can add the new ADO.NET Entity Framework model with NorthWind SQL database. Map the only two tables Order and OrderDetails, after that we have the following situation. If you not familiar with this procedure, more details you can find on my previous post. The next step in implementation will be creating the ModelView of the MainWindow. The ModelView will contain implementation of all logic of the Master-detail relation. To do that point with right-click on the project, select Add-Class of the context menu item and enter the name MainWindowViewModel. If you have full instatlation of the MVVM Light Toolkit you can use MVVM template specialized for creating ModelView class. After we create file of the MainWindowViewModel, we have to implement class and add two properties MasterCollection, and DetailsCollection. 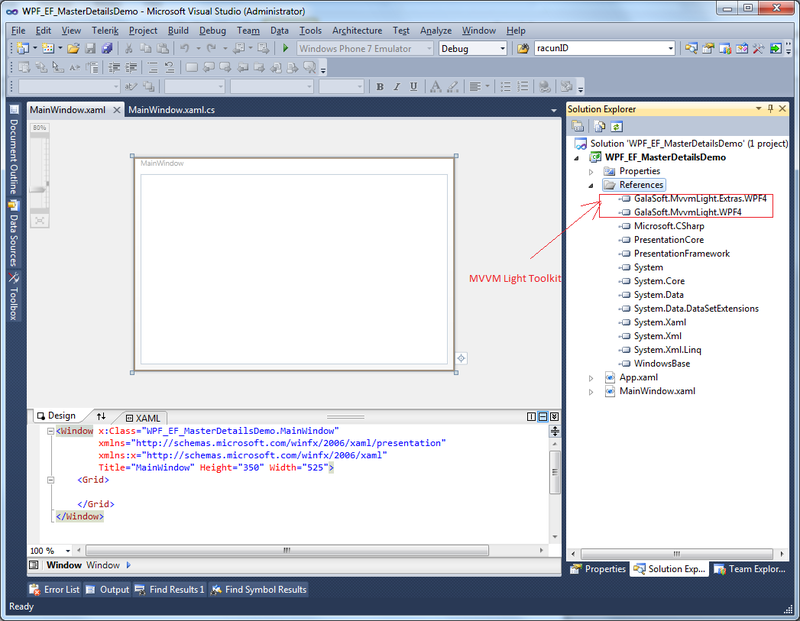 The Next source code listing shows implementation of the MainWindowViewModel. This is minimal code for work with master – details in Entity Framework. The sample is so short that it can fit in to single image ;). 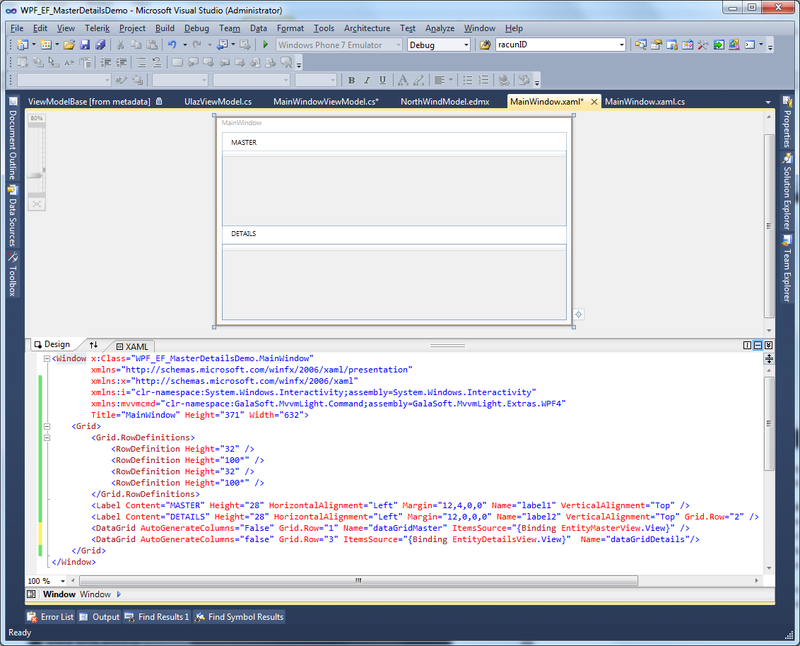 In the code-behind constructor create MainWindowViewModel and assign to Windows DataContext, and that’s it. This post demonstrate one posible implementation of the Master-detail relation in EF by using the MVVM pattern. The source code of this project you can find on SkyDrive. Na najvećem sajmu potrošačke elektronike i inovacija CES koji se održava od 6-9. januara u Las Vegasu u USA, Steve Ballmer šef Microsofta pored zanimljivih stvari oko Windows Phone 7, igraće konzole Xbox 360 i KINECT, kao šlag na tortu najavio je novu verziju Windowsa 8 i prezentirao neke novine koje dolaze s njim. 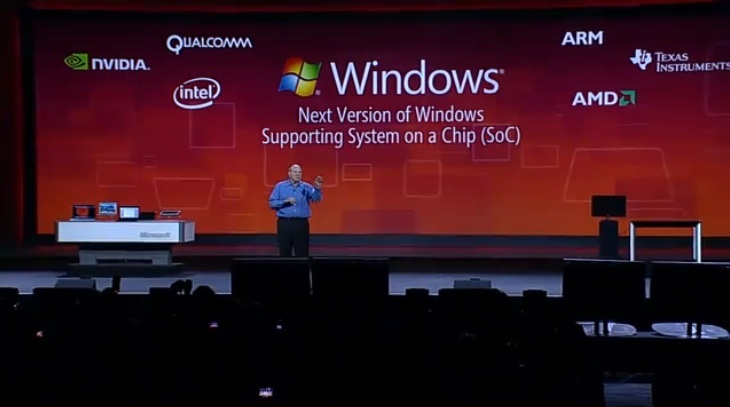 Naime, u saradnji sa proizvođačima hardvera prikazan je set novih uređaja koji imaju svojstvo System on Chip (SoC), a što će podržavati nova verzija Windows 8. System on Chip (Soc) kao pojam označava integraciju svih komponenata u jedan čip preko kojeg se mogu obrađivati kako digitalni tako i analogni signali. Tipična primjena ovakvih uređaja su embeded sistemi. S druge strane System on Chip predstavljaju uređaje koji su dizajnirani za mobitele i tablet računare. Ovo svojstvo omogućava istim uređajima dramatično povećanje vijeka trajanja baterije, odnosno smanjenje energije koje je potrebno imati za njihov rad. SoC predstavljaju ARM bazirane sisteme koje razvijaju microsoftovi partneri NVIDIA Corp., Qualcomm Inc. i Texas Instruments Inc. Tehnologiju koja je demonstrirana na razlčitim uređajima sastojala se od hardverskog ubrzanja grafike i media playbacka, kao i uređaje na kojima je demonstriran rad Office 2010 programa u prirodnom obliku, demonstrirajući printanje dokumenta iz MS Worda. 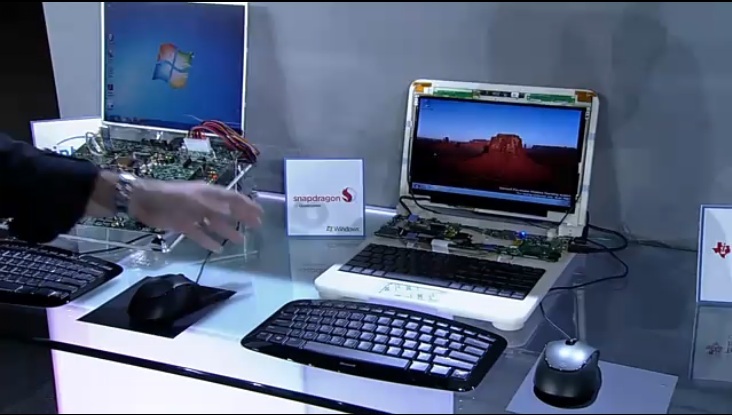 Pogledajte video ove vrlo interesantne prezentacije SoC tehnologije i Windows 8 OS-a.